Essence's Model Rocketry Reviews (EMRR) is happy to introduce the sixth "virtual" rocket contest. The theme for this contest is Longnecks. This is a term that may have originated from EMRR for tall skinny rockets with a length-to-diameter ratio of at least 30:1. In other words, all qualified entries must be at least 30 times longer than their largest diameter. So, grab your favorite rocket simulation software and build a rocket that meets the requirements below. The official flights will be run using RockSim ver 7.04, but any software (RockSim Free Demo, SpaceCAD, VCP) can be used to test your design. Heck, you can even do it by hand if you want. The "virtual fly-off" will start on February 28, 2005. Entries must be received by 2/27/2005. A contestant whose entry does not meet the contest guidelines will be notified and allowed to re-submit a corrected entry. Please submit your entries early to ensure that you will have time to make corrections if necessary. This is especially important for RockSim demo and other software entries. Contest will take place from 2/28 - 3/4. All designs must have Length/Diameter ratio (L/D) >= 30:1. The largest diameter tubing will be used for this calculation. Nose cones and transitions must not account for more than 25% of the total length. For multi-stage designs, the L/D must be >=30:1 at all times during the flight. Booster stages do not need to be >30:1 by themselves. For example, an upper stage that is 26" x 0.736 (35:1) with a 4"x0.976 booster would be legal ((26+4)/0.976" = 31:1), even though the booster by itself is only 4:1. No external boosters. Clustered engines are allowed to hang out the back of their airframe tube, but may not stick out the sides. For example, you may not strap four 24mm motors on the outside of a 13mm central tube and count that as a 0.544" diameter. You would need to surround the engines mounts with a 2.6" tube. Loaded takeoff weight must be less than 16.0 oz. Motors may the same size or smaller than their motor tube size; exact size is not required. (This is a change from previous contests). No on-board electronics to perform staging, air-starts, or ejection. One set must be completely in front of the midpoint. Each qualified set must have a semi-span and a root length at least as wide as the tube it is mounted to. Additional sets of 2-8 fins are optional. These extra fins do not need to meet the location, semi-span, or root-length requirements. Fins can not be any thinner than 1/8" of an inch if balsa, cardboard, or paper, or 1/16" if stronger material. Streamer must be at least 0.001" thick. Maximum length: Whatever will fit into the body tube. Streamer folding IS allowed to increase the drag. Mass Objects ARE allowed for adjusting CG. (This is a change from previous contests). Your rockets will participate in four events and will accumulate a total score. All events will use a 72" launch tower and your choice of motor configuration (different for each event). 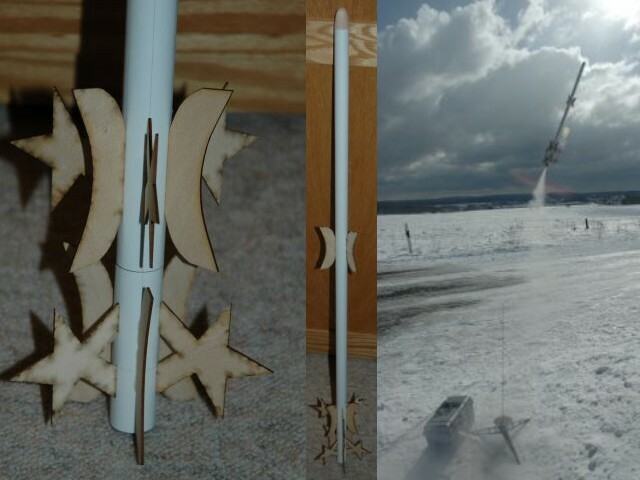 For each event, you must also choose a launch angle, no more than +/- 15 degrees. Altitude: (See Results) Go as high as you can, but do it with style. The score for this event will be based on a combined ranking from each of these categories. Low and Slow: (See Results) The score for this event will be based on a combined ranking from each of these categories. Drag Race: (See Results) The score for this event will be based on a combined ranking from each of these categories. Bob indicated, "I spent about 10 hours over the last three days working on it, bringing the total time to about 25 hours. With some changes I made this week I was able to boost the altitude about 50% and the streamer duration about 75%. I hope that's enough." 25 hours of prep work for a total of 42 minutes in the air... how'd he do? Claude enters his 3rd VC with his "Flaming Spaghettini". He shoved the biggest streamer possible into this rocket. I had to zoom in very close to make sure it was within the tube lines. That gave him the solid 1st place in the Streamer Duration. He also placed 2nd in the Drag Race using that long streamer to secure the Longest Time in the Air. Dave is coming back to the contest field for the second time. He is walking a bit tall after winning VC#5. He stayed in that upper 3rd the whole time with his best events being the Low and Slow and Drag Race. Nice job, and welcome back (come again)! I was loving the fact that all these newbies were flying this time. Chris' rocket scared me! At the time of his entry, he was the second highest flier. He gave high end performance and with a little more attention to the drag race could have placed higher. Well done, Chris! Chan is another old pro who has participanted in very VC that EMRR has had. He won VC#2, took third in VC#3 and then dropped out of the top 5 for VC#4 and VC#5. Welcome back to the top 5! Bruce IS an old pro. He has been in EVERY VC that EMRR has held. I regret not being able to display these hugh rockets in 3D, because even for this one Bruce used decals. Bruce consistently performed in the upper 3rd of the group. Todd's was the first entry and until Bob Cox got his entry in, Todd was top dog! He won Event#1, did well in Event #2, and then kind of dropped from there. Todd will be holding the "Mullin Invitational" for VC#7. This was Jeff's second contest. After placing 3rd, he learned "Longnecks" are not like throwing a football! Interestingly, he was in 15th place for events #1, #2, and #3 and then pulled off 1st place in the Drag Race. This moved him way up! Jim is becoming one of the old pro's. This being his 4th contest. He improved his position each event, even placing 2nd in the Low and Slow. He improved all the way up to 3rd place... until the Drag Race. Forget how Joe's rocket performed in the contest! Click on his build bonus and see the real thing! Very nice. I wish more would build their designs. John too is a newbie. I like the booster. John found a bug in the component database - he selected fins are "G10 (PML 0.062"")" and set them to 0.125 and guesss what, their mass is 0.000 oz.! Bill is another newbie and again I have to say, his rocket design looks clean and very buildable. Bill was a middle of the pack performer and we look forward to his next contest. Clive staying up until nearly midnight just to sneak this design in. He was, no doubt, feeling pretty good after event #1 and #2 which placed him 3rd. Then where was he going in Low and Slow? Seemed to have missed a little rule that would have helped him greatly. Clive should have known since, he too has been in every VC contest. Jeff also took on the field using the "Demo" version. He says he loved participating and learned a lot about RockSIM... we agree and look forward to his return for VC#7. R.S. is our first newbie entry. In general, he produced a nice looking rocket. He should have built it. R.S. 's best event was Low and Slow. His near-the-top performance placed him 3rd in the event. Adding his bonus points to just this event pushed him to 1st. This was Layne's first event and he really got into the fin design didn't he? Nice. Layne struggled in events #1 and #2, but did not do too bad in event #3 and #4. With some more practice... watch out! Lance was our first "Demo" entry. You have to appreciate the courage of those that enter with a "Demo" version since they can't save thier files. Once I build them up one in version 5, they can test and fine tune, but it is not easy. I should probably give them bonuses. Welcome back Bob! This is only your second contest, with the first being the very first VC. With all that time off, we realize you are just getting warmed up! Eric's first contest and with the "Demo" version. Glad he competed and I like the reverse-swept fins. Eric, study the designs and come back and show them all what kind of student you are! Altitude: Go as high as you can, but do it with style. The score for this event will be based on a combined ranking from each of these categories. EMRR Comments: Wow, Bob Cox, beat the next closest by over 300 feet! But, check out Bill Cook with two little ol' C6's, had the greatest Feet/N. Dave Austerberry's was the only single-stage rocket to get into the top 10. Newbie, Chris Coffin, had consistent and impressive results. With his bonuses, he was able to get into 3nd place. In the end though, it was Todd Mullin with his 117:1 Length to Diameter ratio rocket that was able to pull off the win in Event #1. Update: After all that, a problem was pointed out to me on Clive Davis' entry. It appears that some of these designs must run in Barrowman Sim verses Rocksim Sim. Clive's is one of them and Chris Coffin's is the other. Then there is Layne Rossi, John Bonnett, Jim Myers, Joe Policy and Bob Cox who's design can only run in RockSIM mode due to design features. Lastly, there is Claude Paquin that if run in Barrowman Sim has stability problems. All the rest, whether you run them in Barrowman or Rocksim sim get about the same results. EMRR Comments: Well, Claude Paquin, we don't know if you could ever pack a 600" x 12" streamer in to a 0.976 tube in "real" life, but in the virtual world you passed. You also found a bug in RockSIM calculated weight, because the 500 square foot x 0.001" thick, "1.3 oz. Ripstop Nylon (SkyAngle)" streamer only weighed 0.103 ounces. Not likely, but not your fault. A bug in the system. BTW, you weren't the only one that happened upon that bug; Jeff Henry and Dave Austerberry did also. * Interesting to note how many people used the default streamer chosen for them by RockSim. As well as those that didn't choose to "Fold" their streamers. Low and Slow: The score for this event will be based on a combined ranking from each of these categories. EMRR Comments: This was an interesting event. Five rocketeers with multiple stages, flew less stages during this event. Did this help them? Sure it did, however, it was Dave Austerberry's single-stage rocket that just popped over the 50 foot mark. He was a bit too fast in doing it because it was the 3-stager of Bob Cox that turned in the slowest velocity while flown in the 3-stage configuration. Bob's altitude was 2nd lowest so with his velocity he technically won the event. But by applying the bonuses to this event, then , R.S. Barker won it. Jim Myers, R.S. Barker and Chris Coffin turned in nice performances, which really only leaves one question: Where were you going Clive Davis and Eric Maglio? Maybe you missed this rule: "Motors may the same size or smaller than their motor tube size." Drag Race: The score for this event will be based on a combined ranking from each of these categories. EMRR Comments: Bob Cox is the fasted out of the tower = 0.150 seconds...but he didn't win the event. Claude Paquin has the longest time in the air = 1401 seconds...but he didn't win the event. Bruce Levison was closet to pad = 0.398 feet...but he didn't win the event. Newbie, Jeff Caldwell, will be recorded as the winner of the Drag Race!!!! I'm out of time, so the final update will have to be tomorrow AM! Each of the first 3 events have a "placement score" described. That placement score will then be reversed ranked by the total number of entries. This will give the maximum number of points to the winner in the event. For example, if there are (4) entries and in contest #2 (maximum altitude) and entry #1 gets 800 feet, #2 810 feet, #3 750 feet and #4 950 feet. Then the scores will be 2 points for #3, 3 points for #1, 1 point for #2 and 4 points for #4. I've downloaded the virtual6.eng file. How do I get RockSim to ONLY use those motors and ignore the other motors or other .eng files? There must be at least 2 sets of 3 - 8 fins". Does that mean 'per stage'? If my design is a two-stage (i.e. booster and sustainer), and each has a set of fins, does that satisify the design criteria?